"It all boils down to the people." On August 7, 1916, the Battle of the Somme – the bloodiest battle of World War One – was into its second month. Robert Borden was prime minister, and Thomas Langton Church was mayor of Toronto, which had a population of just over 200,000. That was the day that Rose Wolfe, then Rose Senderowitz, was born in Toronto to Romanian immigrants, owners of a small bakery in Toronto’s Kensington Market. Wolfe (BA 1938, Dipl.SW 1939, Hon. LLD 1998) has a long association with the University of Toronto, starting as a student in the 1930s, later serving on Governing Council in the 1970s, chancellor in the 1990s, and continuing to this day on various committees and campaigns. She established the Chancellor Rose and Ray Wolfe Chair in Holocaust Studies, served as a senior fellow and visitor at Massey College and a senior fellow at University College. 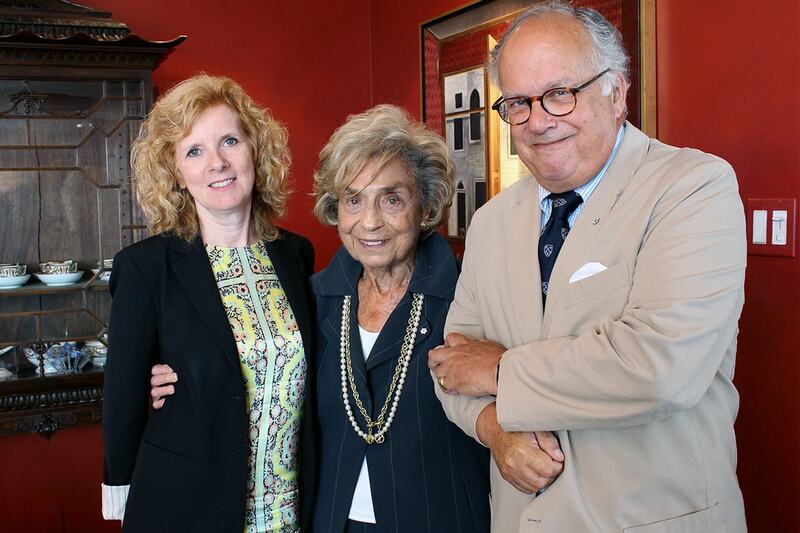 In recognition, the University awarded her an honorary degree in 1998, a stained-glass window at Massey College has been named in her honour, and the University of Toronto Alumni Association has established the Rose Wolfe Distinguished Alumni Award. She is also known for her work with the Canadian Jewish Congress and the Jewish Family and Child Service – where she helped find homes for Jewish children displaced by World War Two – and with many other organizations. U of T News reporter Terry Lavender sat down recently with Rose Wolfe to talk about her long involvement with the University of Toronto. When you stepped down as chancellor in 1998, you told The Toronto Star that apart from your family, the University of Toronto was the closest thing to you. Why is U of T so important to you? The people. I made such friendships over the years in so many different parts of the university, like University College, Massey College, Woodsworth, St. Mike’s College. People like (University College Principal) Donald Ainslie, (Massey College Master) John Fraser, and, of course, Meric Gertler, whom I’ve known for years. It all boils down to the people. Your parents put you and your three sisters through university in the midst of the Depression. Was that difficult for them? We never knew how they did it. They had a little bakery and they sold bread for five cents a loaf. Maybe they made half a cent profit on each loaf, so you think of the number of loaves of bread you have to sell to eke out a living. They were both very industrious people. My mother sewed all our clothes. She worked in the bakery, took care of the whole house and took in two of my orphaned cousins. I remember that right in the middle of the Depression, she decided we should move and we ended up in Forest Hill, when Forest Hill had cows in it. We never knew why she decided to move there when most Jewish families moved to Grace Street or Palmerston. It was a mystery. In the 1970s you joined Governing Council. Was that your first experience with U of T after you graduated in 1938? Yes. My husband was very close to the Conservative government at the time, and through that connection, I was appointed to Governing Council. Unfortunately, I took on the Governing Council position the same year that I was president of the Canadian Jewish Congress Toronto branch, which was a full-time job. Governing Council kind of got shafted because of that. How did you come to be appointed chancellor in 1991? I got a call from Gerry Schwartz (founder and CEO of Onex Corporation). At first I thought he wanted me to be on the committee to choose the next chancellor. I finally got the message that he wanted me to be chancellor. I screamed at the top of my lungs, “No!” I kept saying “No, no, Gerry, just forget it.” But he invited me to breakfast – he had an excellent chef – and when I walked in to his house, there was (U of T President) Rob Prichard, (Governing Council Chair) Bob McGavin and Gerry. They closed the doors. By the time I left Gerry’s place, I had said “yes.” You would have had to be very strong to say no to those men. What was it like working with Rob Prichard? We already had some Jewish studies courses at U of T, but Rob was looking for something more. I had no idea how to get started, but we were very fortunate and now we have a very thriving Jewish Studies program. What were some of the issues you dealt with as chancellor? Just as when I was a student, one of the problems with U of T is how to get commuter students more involved. They go to their lectures, maybe go to the library and then they go home. When I became chancellor, I felt we had to do something to bring these kids into campus life. So I worked on that. I was also concerned that the university was neglecting non-wealthy alumni. I suggested to the fundraisers that it would be nice if we paid attention to the many people who couldn’t give millions of dollars to the university but could contribute small amounts. And when we did that, we were very successful. You are still very much involved with U of T. What sort of activities are you doing now? I’m involved with both Massey College and University College. Donald (Ainslie) at University College and I talk a lot. Right now, I’m looking over the plans for the UC reconstruction. Donald tosses ideas out and we talk a lot. What advice would you give someone going to U of T today? Stay in residence if you can. It’s a completely different experience. If you’re in residence, you’re involved in everything that’s going on. You’re right there at the heart of things. While you’re at U of T, the university is your life.